Congratulations to Ksukeena, urbanblisslife and caperobin, papercut winners! Believe it or not, I have another great giveaway to share with you today... hmm, Mother's Day, Father's Day, and wedding season must be on the way! Before getting to the giveaway details, here are examples of just some of the popular paper cuttings created by Twenty Fingers in Milton Keynes, England. They are wonderful gifts for marking special occasions. 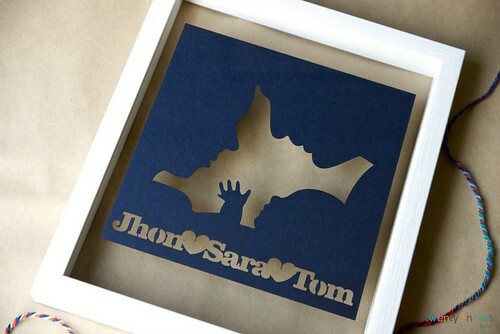 Twenty Fingers, the home-based business of Lana and Ivan, is an apropos name considering both play critical roles in creating customized papercuts and overseeing prompt shipment to satisfied clients. Their current lead time is just 5-7 days. Lana draws the artwork on her computer, laser cuts the design in a choice of two sizes (standard 10 x 12 inch or large 12 x 16 inch) and 21 paper colors, and hand-finishes the tiniest details. Then a papercut is framed (optional), attractively wrapped, and carefully packaged for mailing. 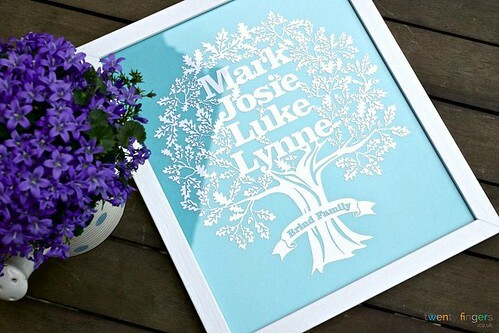 Lana is happy to personalize any papercut down to the smallest detail, so contact her to design gifts for weddings, anniversaries, new babies, pet portraits, birthdays, new homes, song lyrics, quotes, or whatever is meaningful to you. Take a look at the Twenty Fingers Gallery to view completed designs as inspiration for one of your own. 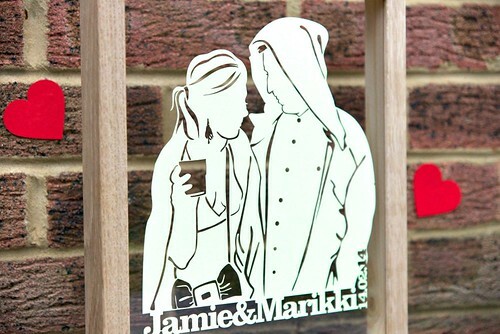 Twenty Fingers has created hundreds of papercuts since the business launched just last year and has already grown a whopping Facebook following and gathered many positive reviews. Their handsome frames are handmade in Buckinghamshire and available in black, white, ivory, oak and walnut. In addition to a traditional frame, they offer a modern float frame that allows the wall behind a papercut to show through. Now about that giveaway: Twenty Fingers will be sending an unframed papercut of choice to three winners worldwide! They will gladly frame a winner's papercut for free, but delivery will need to be paid by the winner, approximately £23 or $35. To enter, just leave a comment on this post now through Sunday, May 3. Please be sure to include a way to be contacted within your comment. Earn a bonus entry by following @allthingspaper on Instagram and liking the giveaway photo. The winners will be chosen at random and announced here and on Instagram as soon as they have been contacted. Good luck! Wow! Haven't seen anything like this before! What beautiful work by Lana and Ivan. Thanks for showcasing them. Oh my gosh! So AMAZINGLY LOVELY!! These are absolutely stunning! Thank you to Twenty Fingers and to you for hosting! I also follow and liked on Instagram! Beautiful work—the dogs are just great. Beautiful job!! There is nothing like paper cutting!! 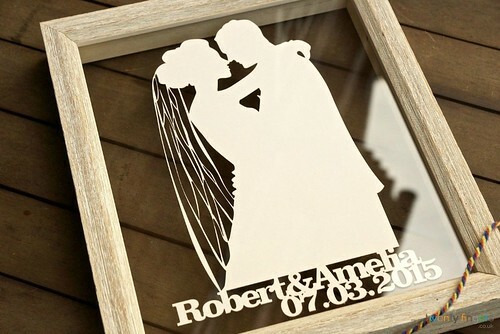 What an amazing craft papercutting is! I 💜it! I would love to have a papercut of my "grand kitties"! They are in Canada and I miss them. Fabulous work. Love the family trees. Beautiful! Definitely a one-of-a-kind gift for any occasion. I love this beautiful craft - I hope to win this!! These are very pretty. Would be a lovely addition to any room. These are lovely. Would love to win one. Would really love one of these for my home - amazing work! Twenty Fingers papercuts are awesome! Thanks for introducing us to this group. Great stuff here. Their work is fabulous! thanks! What a lovely competition, would love to be a winner! 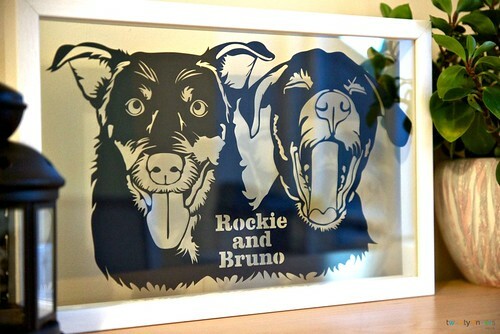 the wedding is coming up, this paper cutting work could make party more shine !! 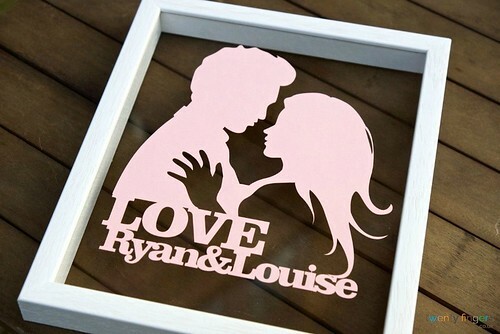 I love the Personalised Silhouette Papercuts. so neat! The dog one is so adorable! This would be perfect for my mother in law! Awesome! The giveaway has ended. Thanks for your interest and enthusiasm!